The Oriel Glass Studio has recently relocated from Hertforshire to the historic market town of Bishops Castle in Shropshire accepting architectural stained glass commissions nationwide; simple restoration and repairs, domestic panels and larger public works. Since 1995, Helen Robinson has built up an extensive portfolio of windows for private houses, places of worship and other public buildings. 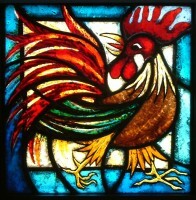 She has a particular interest in the appropriate use of design in historic buildings and period houses and has gained a wealth of knowledge from a close study of glass painting techniques through observation and restoration of old windows. Qualifying from Central St Martins College of Art and Design in 2003, Helen’s contemporary work is founded in age old techniques making her windows a fascinating fusion of old and new, ‘modern medieval’ and a jubilant reversal of the concept of traditional stained glass being a lost art. Helen is a Freeman of the Worshipful Company of Glaziers and an Associate of the British Society of Master Glass Painters being a member of their Council from 2004 - 2016. She teaches stained glass from the studio, runs workshops for primary and secondary school students and is a regular contributor to the short course programme at West Dean College near Chichester . Copyright Oriel Glass Studio 2019©. All Rights Reserved.